Sculpture is an art form that dates back to the earliest cultures of humanity. Some of the world's finest examples of ancient art exist in the form of sculpture, because sculptures can be fashioned from extremely resilient materials. Very few scrolls, books, and paintings still exist undamaged from the time of ancient Greece, for example, but stone and bronze sculptures were made with the permanence necessary to last millennia. Durability and permanence are two reasons why sculpture has so long been a popular, common artistic medium. But sculpture also provides opportunities for expression that media such as drawing and painting can't. Sculptures can be rendered in three dimensions, allowing them to be enjoyed and appreciated from all angles and perspectives. In fact, sculpture is a visual medium that even the blind can appreciate and create! Sculpture is a diverse medium; works of 3D art can be composed out of almost any material. There are a few materials, however, that have such great versatility that they can be used to make sculptures in nearly any size, shape, or subject. Although clay, wood, stone, and metal have been staples of sculpture since the dawn of civilization, artists even today are still coming up with improvements and new uses for them in the pursuit of expression. If you'd like to learn more about the history, techniques, and artistic potential that drive sculpture, MisterArt.com has everyday discounts on a great deal of books and media on the subject! Modeling with clays is one of the more ancient and fundamental techniques used in sculpture. Clay is versatile: It can be a sculpture material in its own right, used to create fired sculptures, or it can be used to make sculptures that are ultimately cast in metals such as bronze. Clay is also often combined with man-made materials such as fiberglass resin or cement to create more durable and mass-produced media. There are many different kinds of clay, each with its own strengths and uses. Smooth clays show fine detail when modeled but are typically softer and mushier. Coarser, grogged clays are firmer and better able to support themselves, making them better suited for large-scale sculptures. Hardening clays are clays that will harden by themselves without being fired in a kiln. These clays are perfect for sculpting if you don't have access to a kiln or want to create your sculpture very quickly. When using hardening clays, however, take care not to let the clay dry out before you're finished modeling it! Non-hardening clays need to be fired in a kiln to set. Non-hardening clays are ideal for projects that are going to take a while to finish—they won't completely dry out and harden like hardening clays will. They're also great for using glazes that also need to be fired in a kiln to achieve their desired color or effect. MisterArt.com carries low-priced clay sets and kits that include everything you need to create a clay sculpture. They're perfect for beginners! MisterArt.com also carries a selection of molds that you can use to reproduce and cast your favorite sculptures! Modeling wax is a very useful tool to sculpt with, because it has properties that make it a convenient medium for both modeling and casting in molds. At ordinary temperatures, modeling wax can be cut and shaped easily; it melts into a liquid at a low heat; it mixes with nearly any dye or colorant and tints well; and its texture and consistency can be modified by the addition of clays, oils, and fats. When molten, modeling wax takes even the finest impressions of a mold, and it sets and hardens at a mild enough temperature that no ordinary climatic influences affect the shape it takes. These advantages that wax offers for modeling have made it a popular sculpting medium since the Middle Ages. You can receive the fastest shipping on the Web by ordering modeling wax from MisterArt.com! Modeling frames and wires are used to create armatures, frameworks around which sculptures are built. Modeling frames and wires provide structure and stability for your sculpture, especially when a malleable material like wax or clay is being used as your medium. Modeling frames and wires basically are used to form a sculpture's skeleton, and they serve essentially the same purpose-- to hold the form erect. Modeling frames and wires are typically stiff, but can be bent and twisted into shape without too much difficulty. The wire is often attached to a base, which is usually made of wood. The sculptor can then begin to flesh out the sculpture by adding wax or clay over the wire. Depending on the material and technique, the armature may be left buried within the sculpture. If the sculpture is to be hollowed out for firing, however, the modeling frame must be removed. If you're using your sculpture to create a mold, you can even reuse your modeling frame and material! MisterArt.com has everyday discounts on pre-made modeling frames as well as modeling wire that can be used to create your own armatures. In addition to metal wires, you can even create armatures from metal mesh and woven fabrics from our stock. To carve the many different kinds of stone available on the planet, sculptors have traditionally used basic handheld carving implements such as chisels, hammers, and various specialty tools and accessories. The basic steps involved in carving stone are design, percussion removal, hand rasping, sanding, and finally finishing and mounting. The basic handheld stone carving tools needed to perform these steps are the point, the rake or tooth chisel, the flat straight chisel, and the hammer. All of these tools are available in different sizes and weights. Miniature stone carving tools made of high carbon steel have also been developed for finer detail carving. Typically, these are about ¼ the size of standard stone carving tools. For the beginner, a good place to start collecting stone carving tools is with a basic stone carving set. These sets contain all of the primary stone carving tools necessary to carve a simple sculpture, including a point, flat chisels, a roundel, and a 1 ½ –pound hammer. These tools and more are available at special VIP prices at MisterArt.com. The thumb and fingers are by far the oldest and most popular modeling implements, but the use of more specialized modeling tools is sometimes required to make a sculpture look the way an artist envisions. Like nearly all art tools, modeling tools come in a variety of shapes, sizes, and materials and are used for a plethora of purposes. Primarily, they're used for cutting, scraping, and shaping modeling materials to create a desired look. The most common modeling tools used by sculptors are wire end tools for cutting and scraping away clay or other material and tools constructed of solid wood or plastic designed for detail and shaping work. Tools typically wear down over time, especially when they're being used on abrasive modeling materials. With a lot of use, wooden tools will even begin to take the shape of the sculptor's thumb! Wire end tools are perfect for subtracting clay from a sculpture in order to achieve the intended shape. Solid tools are great for shaping, contouring, and smoothing the clay. In addition to these, it's also handy to have a wire clay cutter designed to cut off sections of clay from the large blocks that clays are typically sold and shipped in. Modeling or sculpture stands are useful for moving your work-in-progress about while you shape it. These turntable-like tools allow you access to each side of your sculpture without sliding it around on your work surface or moving around it yourself. Calipers are also a great modeling tool to measure the size of your sculpture in comparison to your subject. MisterArt.com offers great prices and fast delivery of the industry's best-quality modeling tools. Wood carving tools are similar to stone carving tools in many respects; hammers and chisels are the traditional primary tools. Naturally, of course, wood is usually not quite as hard as stone and wood won't shatter when struck in the way that stone will. Instead, wood can be gouged and cut by wood carving tools in order to form a rough shape. Finer detail carving tools are also available, as well as rasping and sanding tools that aren't dissimilar from those used in stone carving. Straight chisels have a straight flat edge. Straight gouges have curved cutting edges that range in depth. The short bent has a small spoon-like dip used to make quick, deep cuts. The long bent makes longer deep cuts. The straight skew is notable for its diagonal cutting edge. A parting tool is used for furrowing with its V-shaped cutting edge. The fishtail flares out at each tip much like a fish's tail. The back bent's cutting edge curves back away from the cutting face. The majority of these tools are best used with a wood carving mallet or hammer. For finer cuts and details, there is a wide variety of cutting blades, including X-acto knives, available for carving and chipping away at wooden sculptures. Handheld wood carving tools used for chipping and relief work are typically sold in sets. 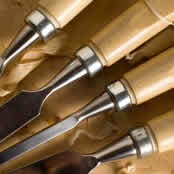 Beginners' sets of wood carving tools are also available for students at MisterArt.com. Making molds for the purposes of casting is a great way to create exact and reproducible sculptures of everyday objects, body parts, trophies, and more. Casting and plaster molds are pre-made molds that sculptors can purchase and use again and again to cast basic shapes. Casting resins are man-made liquid chemicals that can be poured into molds and left to harden in order to create casts. Combined with pigments, dyes, and powders, the finished result of a cast using these resins can achieve a variety of different looks. Molding compounds are substances into which a solid object is placed in order to create a mold. Once the compound has hardened, sculptors can split the mold and remove the cast object. Releases are chemicals and lubricants that are designed to ease the separation and removal of a cast from its mold. Mixing cups are useful mold-making tools in that they allow the sculptor to mix and prepare pigments, casting resins, and molding compounds in precise measurements before pouring them. You can find everyday discounts on these mold making supplies and more at MisterArt.com! Thanks for the quick delivery and love the drafting table, chair and stand for my art work. The quality is excellent and will continue to use your service as I move forward.